ESPN made a big deal about Kobe passing Shaq on the all-time scoring list: If there's one thing I learned this week, it's that ESPN is really going to miss Kobe Bryant once he retires. He's an instant segment-starter for them. After Kobe passed Shaq to become fifth on the all-time scoring list on Monday night, Kobe and his Lakers were the main topic of discussion for the opening 8.5 minutes of a shortened 38-minute SportsCenter. That's more airtime than the NHL got all week. The NFL has received at least 104 minutes of coverage each week since Jan. 7: The SportsCenter following the Super Bowl was almost entirely dedicated to the NFL. Outside of commercials, and a few quick highlights, it was pretty much NFL Primetime (without Chris Berman). Put it this way: The NFL won the ESPN coverage battle by its smallest margin yet this week, but was covered 39.75 minutes more than the closest competition. Based on a three-minute segment regarding the 2012 season and whether the Pats or Giants are more likely to make it back to the Super Bowl, it looks as if the NFL will maintain a presence on SportsCenter even while we're months away from any major football event. Rick Reilly made his first appearance during our study: The marquee columnist showed up to say that the Super Bowl should always be a matchup between the Giants and Patriots. OK, Rick, we'll get to work on that. He also hacked out nine lame jokes in 105 seconds of airtime, averaging less than 12 seconds between gags. That included three japes about Giants wide receivers dancing, in the space of two sentences. ESPN was not quite gripped by Linsanity (at least on our count): That qualifier is there because some of the 11 p.m. SportsCenter shows this week were shortened by prior programming. At least once, a Jeremy Lin package was held back until the 12 a.m. edition. 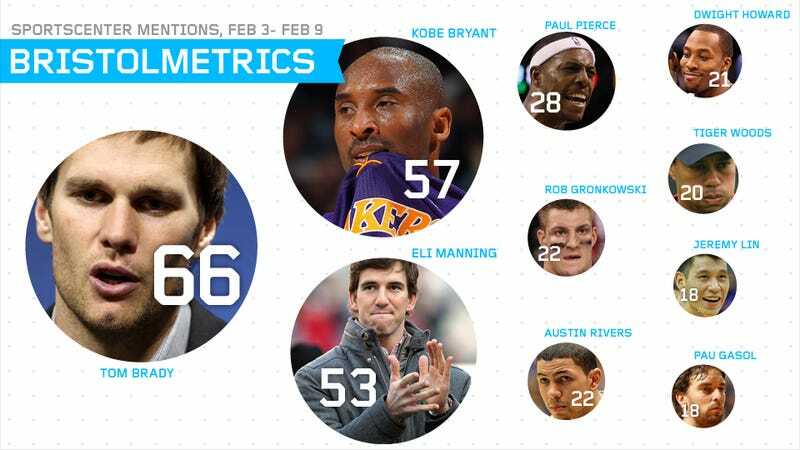 Even so, Lin still was one of the 10 most-mentioned athletes on the program. And Lin's Friday-night performance against the Lakers will belong to next week's tally. So much for that NHL coverage spike: Even in the sports doldrums of February, ESPN decided it was more important to amp up NBA and college basketball coverage rather than directing any attention toward a league whose games aren't carried on the network. Hockey still held its tiny edge over baseball, but it only managed to get the exact same amount of air time that it did last edition of Bristolmetrics (5.5 minutes). The NHL has gotten more than 10 minutes of coverage in a week exactly one time.